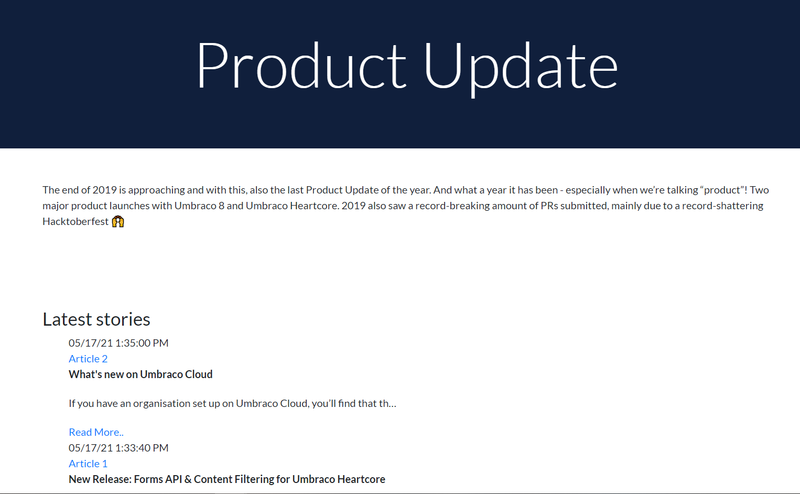 Having an Articles Parent page, and a number of associated child articles which the editors can add to freely, provides a good example page of the power of Umbraco. We'll assume our fictional company, Widgets Ltd, write about ten articles a month and want the articles page to act like a blog (e.g. you could use this functionality for a blog or news and events pages). 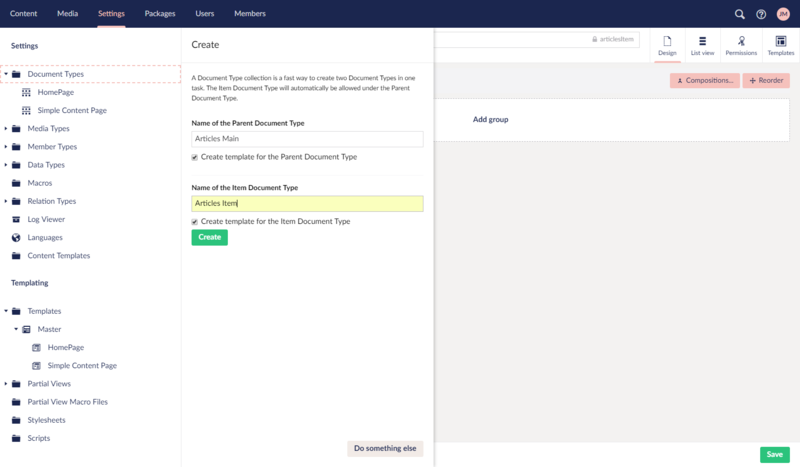 For this you can create a Document Type Collection, go to Settings > Document Types > Create > Document Type Collection call the Parent Document Type Articles Main and the Child one Articles Item. Now go to the Settings > Document Types >Articles Main node > Permissions screen and you will notice that Articles Item has already been added as an allowed child node, this is because we created it as a Document Collection. This allows us to create items under the main (which acts as a parent container). We also need to allow the Articles Main node to be created under the Homepage node (do this in the Settings > Document Types > Homepage node > Permissions screen > Allowed child node types - don't add the Articles Item - only the main should be allowed at this level). Now go to Content > Homepage node (hover)> ... and create a node called "Articles" of type Articles Main (if you don't have this option go back and check your allowed child nodes - did you forget to click Save)? Give the Articles node some content and a title. When you click save you will notice that it has been created as a list view, this means that child nodes are automatically in a list to make it easier to see them, you can create new nodes from this section too, go ahead and create a few. Now you should have a content tree that looks like the image below (obviously with your own page node names). Let's go update our templates we just created (automatically when we created the Document Types). First, update them to use the Master as a parent Settings > Templates > Articles Main node > Master template = "Master" - do the same for the Articles Item remembering to click Save. Copy the template content from the Simple Content Page template and paste this into both the Articles Item and Articles Main (you may need to refresh the nodes again to see these. Set the Master template to be "Master" and then replace the Page field tags with the relevant properties e.g. articlesTitle and articlesBodyText for the Articles Main and the articleTitle and articleContent for Article Item. Take care when copying not to overwrite the first line @inherits Umbraco.Web.Mvc.UmbracoTemplatePage<ContentModels.ArticlesMain> - if you get an exception when loading the page about not being able to bind to source ensure the last part in < > brackets matches your Document Type Alias. If we now go and check our Articles Main page in the browser we should see our content. We'd like to list the child article items under the intro content so that our visitors can see a list of our articles. Umbraco makes this easy for us but we need to use a bit of Razor. Click on the Settings menu from the top menu, and navigate to the Articles Main template. We are going to use Razor to query between all instances of Article Item under the Article Main content node. 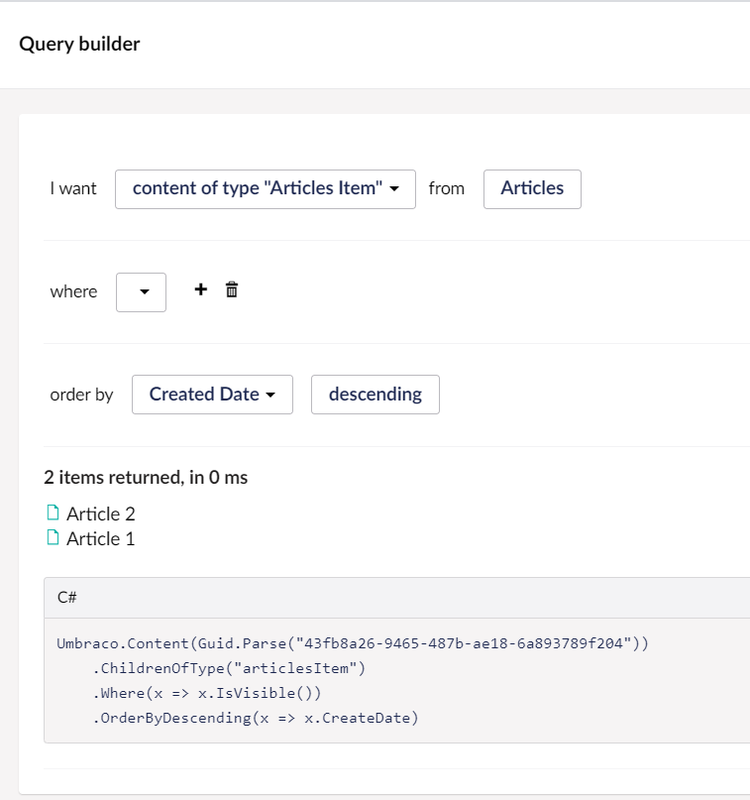 In order to do that, we are going to use the built-in Query Builder. There are a few parameters we need to consider, when creating a query like that. If you've set the correct parameters, you will get a preview of the items being selected with the query. When you're happy with the parameters, click Submit, and you will see a code snippet has been added to your template. Now check this in the browser! At this point we have a basic site, but wouldn't it be cool if we could make the same site in another language? Read on to see how easy it is with Language Variants!